The Euro closed relatively unchanged on Friday at 1.1454, after a series of mixed economic data released throughout the day. German and Italian Manufacturing PMI missed their expectations by printing 49.7 vs 49.9 and 47.8 vs 48.8, respectively. On the other hand, the French and the Eurozone Manufacturing PMI were in line with expectations with 51.2 and 50.5, respectively. Additionally, the NFP report showed that the US has created 304K jobs compared to the expected 165K. But the Unemployment Rate ticked to the upside 4.0% vs 3.9% which left investors a bit confused. Today, we focus on ECB’s Mersch speech, and the US Factory Orders which is set to be released during the day. 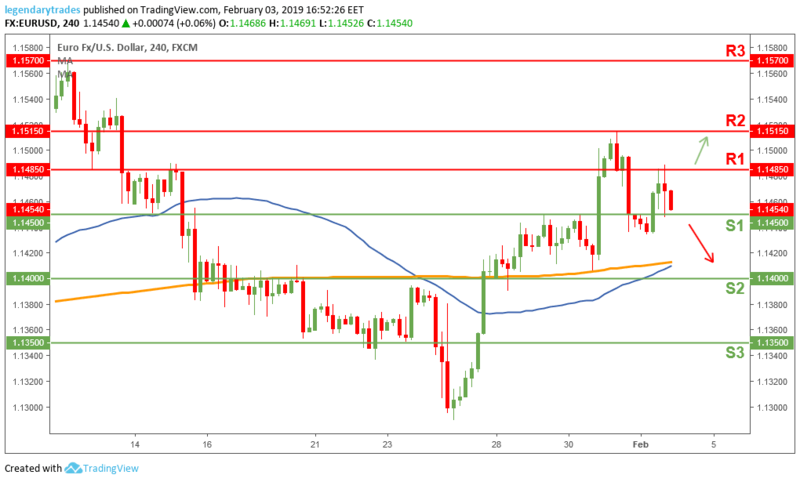 The Euro failed to break above 1.1485 on Friday after the mixed NFP report. If the bulls lose the 1.1450 (S1), then price could retest the 1.14-1.1415 (S2) area, where the 200 and 50 Moving Averages are also located. Alternately, if price breaks above 1.1485 (R1) it could pave the way to retest 1.1515 (R2) resistance.